History.3 - Laser Flash Method | Thermtest Inc. In 1961, W. J. Parker and his colleagues first introduced a high-intensity laser that had the ability to measure thermal conductivity, thermal diffusivity, and specific heat capacity. They would come to call this the Laser Flash Method. 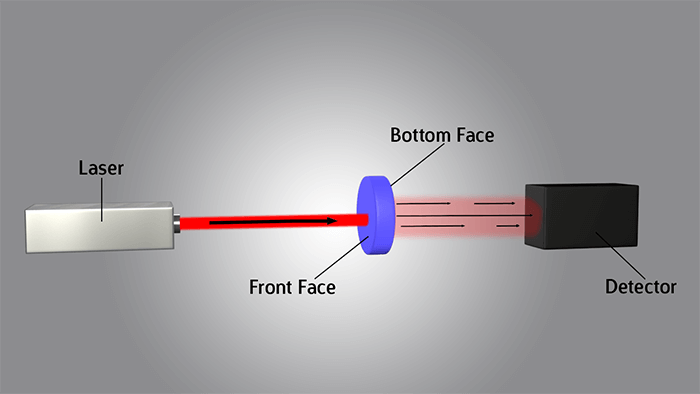 The optical fibre laser beam acts as a light pulse to supply an energy source that is absorbed in the front of the testing material while the temperature is measured in the back by a thermocouple and recorded using an oscilloscope. Laser Flash apparatus has testing temperatures that can range from -125°C to a reported 2800°C in the range of 0.1 to 2000 W/mK. 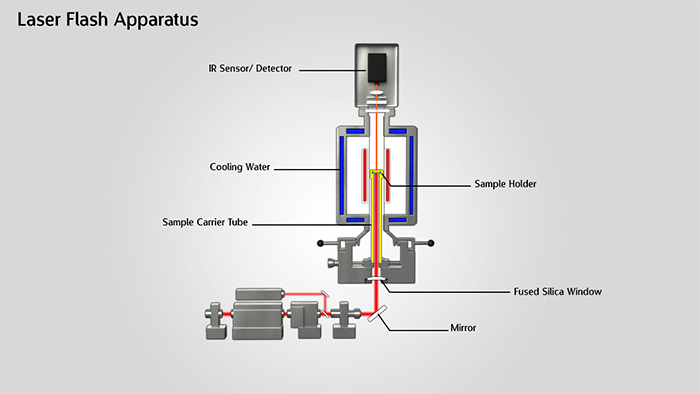 Unlike other methods on the market, Laser Flash cannot measure thermal conductivity directly without calibration. It is determined by the shape of the temperature versus time curve at the rear surface. With the use of a simple formula, thermal conductivity can be calculated using thermal diffusivity (a), specific heat capacity (Cp), and density (ρ) as a function of temperature. As with most methods there are some testing conditions that are needed to obtain accurate values. Laser Flash has sample limitations and complexity associated with using the instrument for measurements. The high temperatures are useful for ceramic and aerospace testing, however limited to a small range of homogeneous material.